I am in leurve with a word. I am in leurve with a word which, it is possible, does not even properly exist: a beatnik-word, a shady semi-respectable possibility. Because there are the most arresting wooden demons carved into the shop front of a place in the street which leads to Canterbury Cathedral; the street which would once have been lined with street vendors flogging bottles of holy water from the holy well, the big approach to the great house of God which must surely have been funded by the great hordes of pilgrims who, for centuries, started at London Bridge and walked all the way to the city where Thomas A Becket was martyred. Or murdered. Or both. It happened a very long time ago indeed. Is it ever long enough ago to forget? A man’s violent death on December 29, 1170 sparked a wave of something near hysteria and made him an instant hero for the people, a saint whom the king must fear far more in death than life. Rumour has it that Henry II, the man who insisted he didn’t order Thomas Becket’s death, had Dover Castle built as a perch on the hill, to brood moodily over the international tourists disembarking to make their way to the shrine. Whether we should have forgotten or no, we haven’t. The pope himself knelt with the then Archbishop of Canterbury, Robert Runcie, in May 1982, to what purpose I am not exactly sure. Pope Alexander III canonised that dead archbishop long ago, there’s a link, I suppose. And the streets of Canterbury reflect the fact that we have never forgotten the hysteria of that martyrdom. Their very geography, their layout and appearance and street furniture is dictated by Becket’s demise. Which brings me to psychogeography: a word the dictionaries seem to shun, the urban dictionaries mistrust. Wikipedia, that strumpet, will talk about anything, but even it insists that its entry needs to be re-written completely to comply with its free-for-all standards. Oddly the Turkish-English dictionary has an entry, translating it as psikocografya. 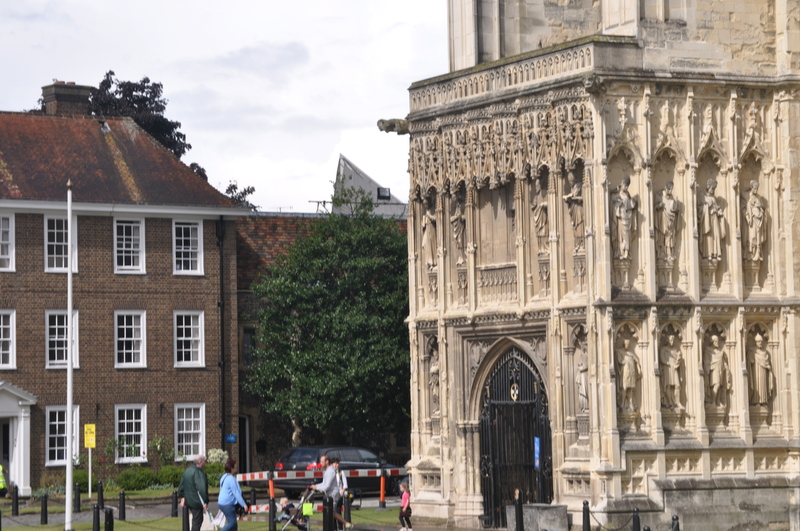 And what an environment Canterbury has set: a place designed to awe and cow pilgrims in equal measure, to stun with towering architecture, to crowd with overhanging buildings, to instil fear and superstition with those grotesques and carvings which people the city. It is as if someone thought: how shall we best get money out of those trusting pilgrims to Canterbury? And then , they built it. Posted in Places to visit, WhimsyTagged Canterbury, history, pilgrims, psycogeography, Thomas BecketBookmark the permalink. I relate to the term. I just didn’t know it existed. Maybe someone invented it for me? I think that is a distinct possibility, Sidey. I think I shall have to have another try at living there some day, IE. Me thinks your gargoyle fetish has taken on a life of its own, to our joy, of course. Laughed at loud at “Wikipedia, that strumpet”, what a great description. Lou, you are right once again. It is gargoyles which started me thinking, especially the way they did not finish at the cathedral but seemed to appear in the streets into the city as well. I think you’ll find it was a worldwide conspiracy! The church has managed to drag money out of our pockets from time immemorial. I don’t know if you have any friends with children at Ampleforth – you could have a chat with them about the fees that the lowly brothers, they of the vow of poverty ( we’ll skip chastity ), charge for their services. Plus ca change, Roger. Its the most worldly kind of unworldliness I know. The effect of place – or can people with their bulidings/built environment affect their places – maybe, not always. The word is perfect, what a great find, and illustration. Thanks, Elspeth….it’s an area I shall be coming back to, I am sure. That word is just too seductive. Oh, d’em shady shadowy words, I have known a few. An they can dance too. But ‘Psychogeography’ makes complete sense for you. Truly intriguing this was for me. Your tale explains to some extent how a friend and mentor, who incidentally was was born in Canterbury but raised in Leeds before falling for Canadian girl, described four pieces I had made for a juried show in Toronto decades ago. “their like the wooden demons which followed me when I was a kid”…..I wasn’t quite sure what he meant, but now I get the picture all these years later. It does make perfect sense now, Doesn’t it, when you see the demons? How interesting, Hudson! Kate, What a beautiful blog. Reading Chaucer is a must and an education. He is, Micheline. There is always something new to find in his tales. Loved the entry, loved the pictures! I too laughed at your descriptions and smiled throughout, thank you! FBA, thank you for commenting. Glad you enjoyed the jaunt round Canterbury. An absorbing city. I’m with Lou — loved that you referred to Wikipedia as a strumpet! The last time I heard “leurve” was in “Annie Hall”, but yes, it does apply to this post. That cathedral is quite a monument and up close, intimidating as it is fascinating. I don’t think I’d want to be in there if the lights went out. Ah, well, here you are, with a little 21st-century bang-up-to-daye leurve, Lameadventures. The word demands it. And now I set to thinking how the streets of New York are a further, quite incredible, example of psychogeography: an urban landscape formed by wave upon wave of new arrivals on a small, affluent island. I love New York. Eric Homberger’s Historical Atlas is one of my favourite books in the world. I’m in leurve with this post, Kate. Such gorgeous pictures, and a word I won’t forget. Wonderful photos, Kate – and now I have a new word to bandy about. I love (leurve) a new word! Whether it shows up in the more traditional dictionaries or not, I think I’ll assume you have legitimized it and it now works for me! It is kind of a play on the “If you build it, they will come” intention. How wonderful to soak up so much history just by being in close proximity to such a beautiful place! We are very lucky, Debra. It’s all around us here. So interesting.. I, for one, don’t understand why they thought it was necessary to put scary images (gargoyles) on churches. The theory being that it scares people straight into church. Not me, I’d be too frightened to enter. Wonderful history behind all your stories. I think grotesques were meant to scare off other evil spirits, Judy. It takes a demon to catch a demon, so to speak. Back then anything was possible, even probable. The folk stories from those times are most alarming. fascinating and wonderfully written. I’m trying to think if I ever heard psikocografya, it does sound familar, if it brings back any memories, will post back. Washington DC, a city planned in every way to dominate and impress foreign heads of state, a city that still has the power to steal ones breath without height or coast. For me, the air feels powerful, rich somehow. If that isn’t a kind of psychogeography, I’m probably missing the point.